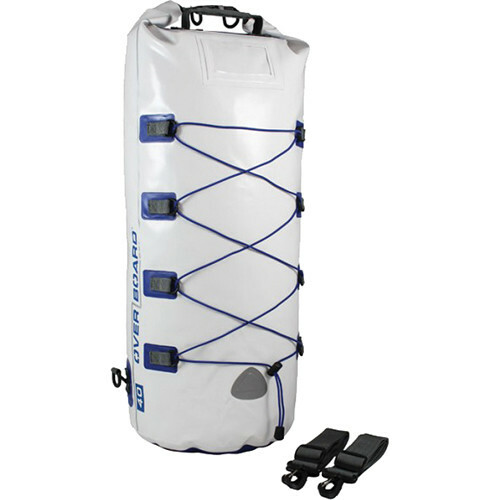 The white, 40L Waterproof Boat Master Dry Tube from OverBoard keeps water, sand, and dirt away from your possessions, including clothes and smaller valuables. It features a front ID pocket, elastic front webbing, a top carry handle, and 2 adjustable and removable shoulder straps with carabiners for wearing as a backpack. The straps can be attached via the clips on the Boat Master. Additionally, the tube has a large reflective patch. Thanks to welded seams and OverBoard's Fold Seal System, the bag is 100% waterproof with an IP66 rating, making it suitable for quick submersion, though it floats when dropped in water. The Fold Seal System lets you tightly roll the top of the tube down over the plastic fastener 3-4 times, then engage the top buckle for a secure closure. The Boat Master is made from durable PVC.